Manami Toyota recently announced her retirement plans. 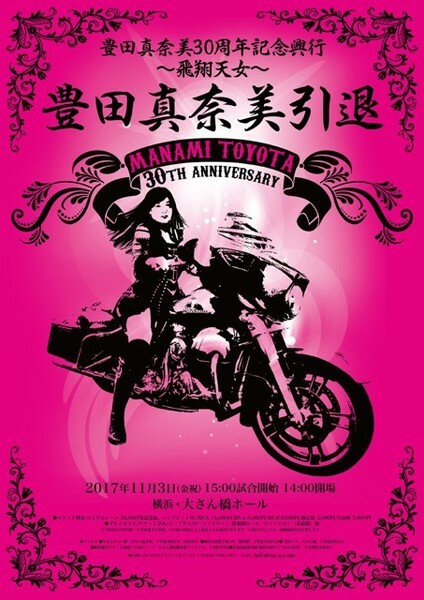 The show, which will also be her 30th anniversary, will be Nov. 3 at the Osan Bridge Hall in Yokohama. Manami has done a two part interview with Sportsnavi where she talks about retirement and other things. Plenty of fans are unhappy that she is retiring. I think her retirement is long overdue. And based on this interview, she seems to agree with that. The first question is why is she retiring. Fans may recall that she had reconstructive shoulder surgery in 2003. Though Manami returned, her shoulder has never been the same. She's in pain 24 hours a day and now it's spreading to her neck. It's very similar to what happened to Ayumi Kurihara. She had shoulder surgery in 2008 and it got to a point where she couldn't lift her arm anymore. She had to retire. Manami says it's getting worse and it's affecting her performance in the ring. With her 30th anniversary coming up, she decided it was time to retire. She probably should have retired back when she had the surgery. She says she got accustomed to the pain and there were no further injuries. She was able to get by. In 30 years, this was her one major injury. She broke her foot once when she was young but there's no comparison. Manami has six bolts in her shoulder. Working with pain is nothing new for Manami or any other pro wrestler. She says working with the shoulder pain was very difficult. And she was still working 200 matches a year. She was asked if all her flying around causes injuries. She says not really. If that was really risky, no one would perform those moves and everyone does them. So what will she do after retirement. Manami isn't sure but she won't stay in the wrestling business. She says she can't watch wrestling now but she plans to try to attend occasional shows with pal Mima Shimoda. She is asked if she wants to be a promoter or trainer. She says she's not interested in promoting. And she says she has tried to teach but she's not good at it. She says for the next six months, she will work mostly for OZ Academy. She may work for some of the other joshi companies. Manami has become friends with Tsukasa Fujimoto so she will work some Ice Ribbon shows. When asked about her retirement match, Manami says she hasn't decided yet. But she is considering a sequel to the famed 1995 match Manami Toyota vs AJW where she faces 30 opponents in succession. As a tribute, Fujimoto did the same match with 32 opponents. She jokes that she doesn't want Fujimoto to top her. Her friends like Aja Kong, Mima Shimoda and Kyoko Inoue will be in her retirement match for sure. When asked about her signature move the Japanese Ocean Cyclone, Manami says she already gave that move to Fujimoto. When asked about the future of joshi puroresu, Manami says things were great in the 90s when they were on network TV. Today the fanbase in Japan is small because of lack of exposure. There's no money to be made. When she started out, Manami thought if she worked hard she could be rich. Then AJW lost their TV deal and the joshi business has never recovered. Of course she would like to see a joshi revival but she knows it's unlikely at this point. Manami says the biggest problem is there are too many joshi compnies. There's just not enough of a fanbase or money to go around. And young wrestlers don't make enough to concentrate on wrestling training. They have to work day jobs. They go back to talking about her retirement match. A lotion match is suggested. She laughs. She says for sure she's not doing a death match or barbed wire. She doesn't want any lasting scars. As the date approaches, Manami will get more excited about her retirement. It's too soon to get excited. She just wants to remain reasonably healthy until the end. At first she says she won't cry at her retirement. But then she says she probably will cry. She's not ready to admit that yet. It will certainly be a memorable event. Check out the accompanying poster.